The Man and I went to a Halloween party on Saturday at a friends house. I can’t remember the last time I truly dressed up for Halloween other than some peacock feathers and makeup. For the longest time I couldn’t think of what I could wear as a costume, and I kind of wanted us to match, so we came up with the idea of a couple from the fifties. I had a dress that the Man convinced me to buy at an estate sale – new with tags – for about $10 that would be the perfect base. His costume was infinitely easier – dress shirt and slacks plus a robe and a pipe and he was the perfect fifties gentleman home from a long day of work. So I had the perfect dress, some over the top jewelry, and kitten heels ready to go. I did some Pinterest searches for easy fifties hair and makeup and got to work. Saturday turned out to be miserably rainy and cold, but never fear! I had the perfect “coat” to go along with the theme. 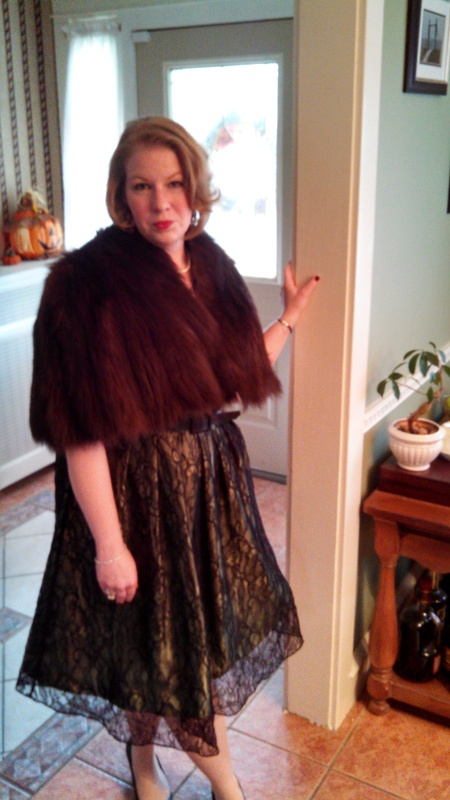 My German Grandmother’s fur cape-let was perfect, and time period appropriate, along with my Nana’s pearls, my mom’s diamond watch, and my already vintage (and way before the fifties!) engagement ring. 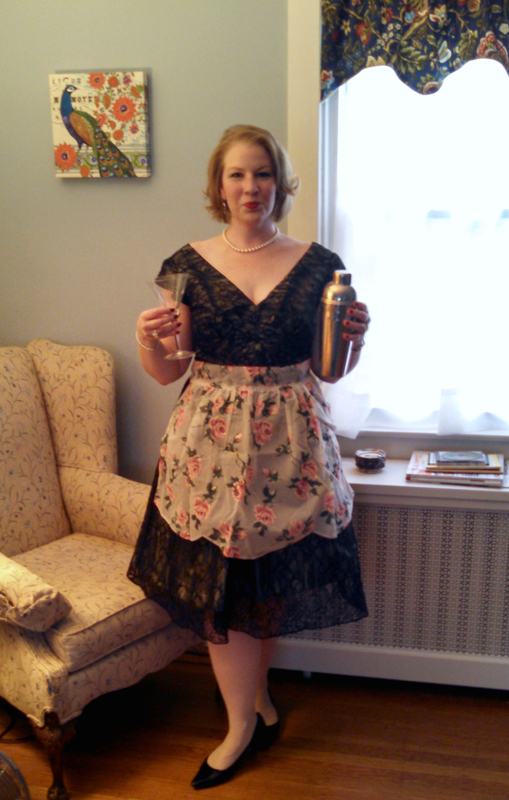 To top it all off, I had an “inside” look with a fancy apron, ready to serve my fifties husband. I was thrilled with how the look turned out. It was funny because one of the women at the party asked me “Is this real?” to several pieces of my ensemble and was astonished when I said yes. I also told her that my Nana would be proud. She was one of those fifties women who would meet her husband at the door, dressed up, makeup on, and dinner finishing on the stove. So often now, we look down on women of that generation, who took care of their husbands and the home and were happy to do so. Talking to my mom later Saturday evening, she said that Nana thought grandpa worked with intelligent men and women all day, and he should come home to a woman who was not only intelligent but also beautiful. And you know what? There’s nothing wrong with that. So here’s to you, Nana, and all you beautiful, hard working, and intelligent women who stay home and take care of your kids, your house, your husband… whatever you do. Don’t ever let anyone tell you you aren’t amazing and just as hard working. And there’s nothing wrong with taking delight in being beautiful while doing it. Previous postfeline friday says happy halloween!